Students are sure to feel confident and successful as they wear their navy blue graduation stoles hung over their gown at commencement. With our fantastic bulk discounts and low pricing, these memorable tokens of honor can come at a price you can afford, too! 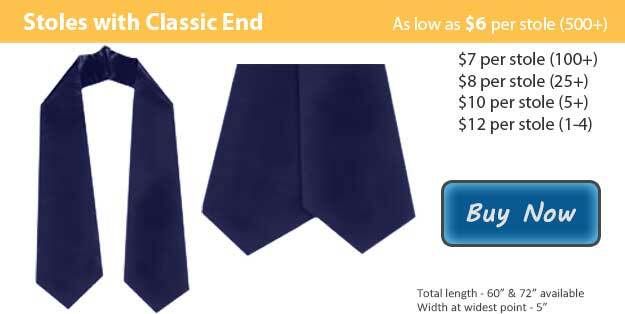 At Honors Graduation, our navy blue honor stoles are made from highest quality crepe back satin, which means your students will be presented with treasured keepsakes that will last! Navy blue is used to signify many different achievements, organizations, or leaderships. It may also be given to all students as a "stole of gratitude," which means students wear them throughout the graduation ceremony, and then present them to a special mentor that helped facilitate their success! However the navy graduation stoles are used at your school's commencement, they are sure to add to the dignity and success of the ceremony. Since 1748, the British Navy has worn dark blue as part of their uniform. Navies from many other countries have also selected the color in their uniforms over the years. Today, this has led to our use and association with the color dark blue with navy blue. With its rich naval history, students will be sure to feel sharp and confident wearing their navy blue honor stoles at graduation! Along with its naval association, navy blue is also symbolically associated with knowledge and integrity, perfect as students commemorate their academic pursuits over years! Contact Honors Graduation today to order your navy honor stoles today, and remember to ask about our amazing bulk discounts!